I am OBSESSED with camera's and photography in general lately, so when I happened upon this print by LadyLotus, I squealed! I really love the overall look of it. The image was originally a hand carved reduction linoleum that she turned into a screen print. I can't get over the detail! 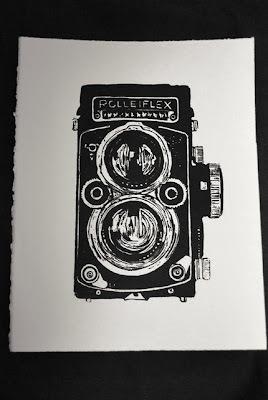 And I really love that it's an old Rolleiflex camera and not just a generic old camera that you often see prints of throughout Etsy, it's just so unique! 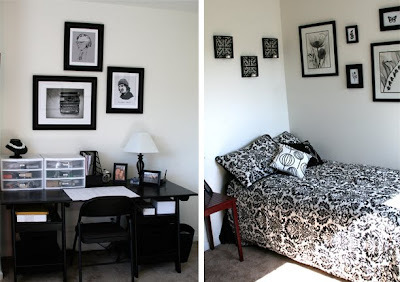 The crisp black and white image would work PERFECTLY in my Black and White themed multifunction Guestroom/Office! Don't you think? I just need to find a couple spots on the wall for them and they will be mine! What do you think? Good fit? I'm itching to paint the walls of this room by the way! I'd love to use a vibrant Lilac color, or maybe even a Robin's Egg Blue! I think it'd just give it SO much more personality! Alas, it is an apartment and painting walls is a huge pain in the booty since I will need to paint them back before I move...boo! I really want to figure out a way to make this room have more zest but still love the crisp Black and White look. Damn you apartment rules!!! I have a wall full of black and white photos it looks spectacular! OMG! We have the same comforter set! SERIOUSLY. We are SO bffs!! I painted my photo/guest room "gun metal" gray and that is how I was planning to decorate it.... all B&W. love it! i also prefer neutral colors in my room. black and white look classic and tidy.